Blueberries didn’t stand a chance – Mark and I split the pack already. We might combine cucumbers with last week and make refrigerator pickles. We’ve got basil coming out our ears and have to make a decision about what we’ll do with it. Green beans will probably end up as a side dish. Tomatoes and green onions will end up as salad toppings. The radicchio and lettuce will make for more flavorful salads. I’ve really been enjoying the variety of salad greens we get each week. The salads are so flavorful. I feel sorry for people who eat salads with just iceberg lettuce. Blech. In our weekly email from the farm, we got a recipe to use up some of our fennel, which we’ll do this week. These fronds are so crazy. Might take the opportunity with the eggplant to find a new recipe. I am particular about the way I eat eggplant because I find it’s often bitter or tough in preparation. And I don’t like a giant slab of it breaded on spaghetti. So I need to get creative. 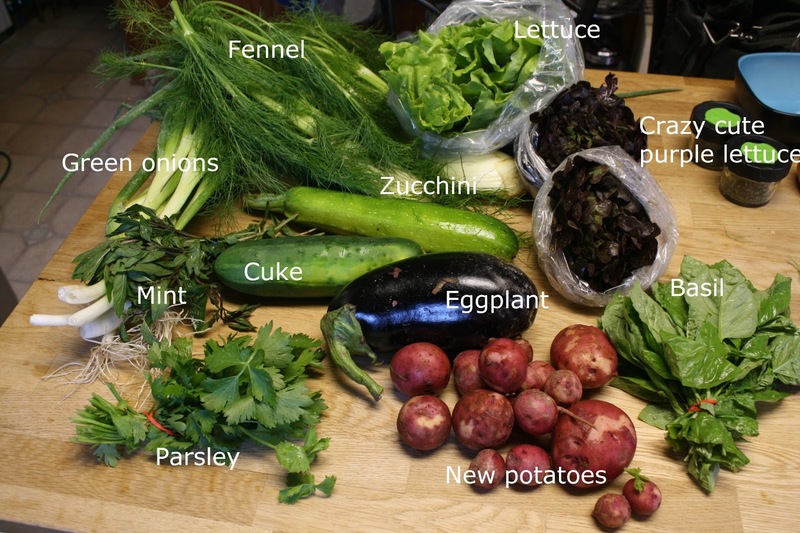 That’s the great thing about CSAs. They force you to get creative with what you’re eating and discover new things! This weekend we’ll be going upstate to take advantage of the bounty of produce in my grandparents’ garden. Beans galore, ready for picking (and perhaps canning?) as well as various other veggies (and possibly raspberries…). This week was a great share, with lots of variety and the firsts of a few things we haven’t seen yet this year. First of all, blueberries. July, organic blueberries. Enough said. I’m going to attempt kale chips again before this kale wilts. Either that or some kind of green smoothie, which I’ve always wanted to experiment with. First yellow squash of the year, which is exciting – really good grilled in planks. Tomatoes are always welcome at this time of year. This cabbage is beautiful and firm. As soon as I saw it, I thought sweet and sour cabbage. First green beans of the year are exciting and will be delicious blanched. Leaf lettuce and green onions will go in this week’s salad. Thinking about making refrigerator pickles with these cukes since there’s not enough to can. The only kind of pickles I like are homemade anyway. We’ve also got more basil that we can handle at this point, with three different types growing in our own garden and it coming in heavy in the CSA. Going to have to make pesto to freeze or freeze it on its own with a little olive oil. 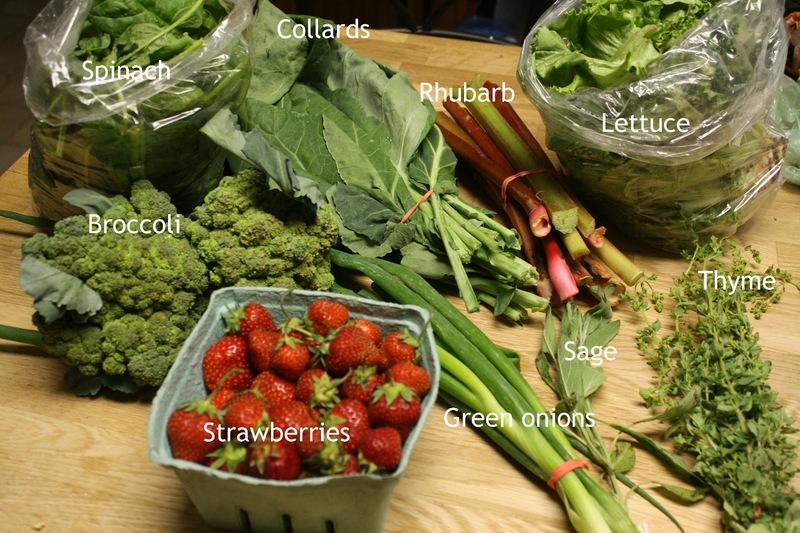 Don’t forget that Clarion River Organics is doing a peak of the season, 6-week CSA, which is a great way to get introduced to the CSA model and determine if it’s right for you. If you can keep up with a peak of the season share, you can keep up with one for the entire summer! 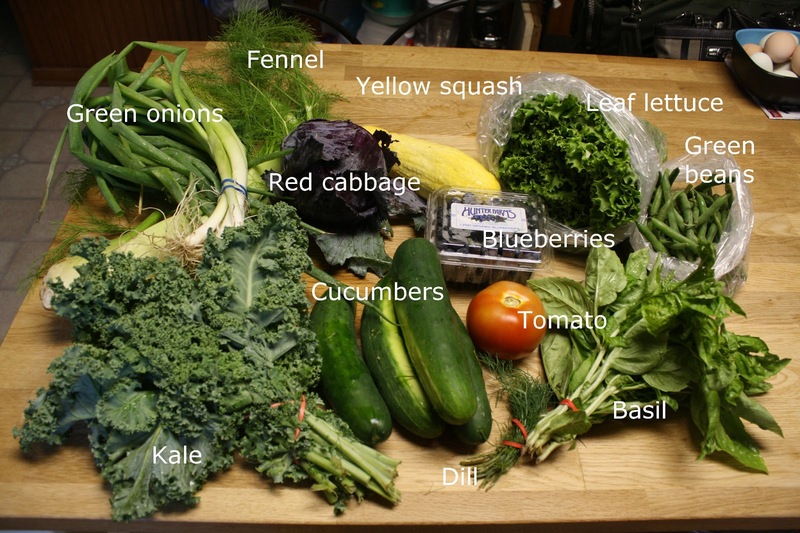 I just read that Clarion River Organics is offering a 6-week, Peak of the Season CSA featuring the best of the summer’s bounty. This is a great way to try out a CSA to see what you are interested in and whether or not the model works for you. There are two size/price options as well – both incredibly reasonable for what you’d pay for produce at the store – and this is the best our area has to offer! Check it out here. Starts the first week in August, so hop on it! This week was a big explosion of diversity in our produce share. Look at this goodness. I could barely fit it in the camera frame. We already decided to make mint ice cream with the first fresh mint. The basil might go in a homemade pasta salad for my family reunion on Saturday. The lettuce will go in salads. Gotta figure out what type of lettuce these tiny little purple bundles are. Any ideas? Whatever it is, it’s lovely. New potatoes are yummy as well. They have to be stored in the fridge, and they cook quicker than mature potatoes. Our CSA email update told us that they aren’t often sold in stores because they turn dark at room temperature and don’t store well. So here’s a treat you can’t get in stores! Someone at our pick up site didn’t want their green onions and fennel, so we ended up with two of each. Not complaining! As soon as I saw this fennel, I thought of a great pasta recipe I have that uses fennel and sausage, which we have from our meat CSA! This fennel is honestly so large it could eat Carnegie. I had to fold the fronds back under the bulbs just to fit it in the frame, but they were easily 2 or 3 feet long! 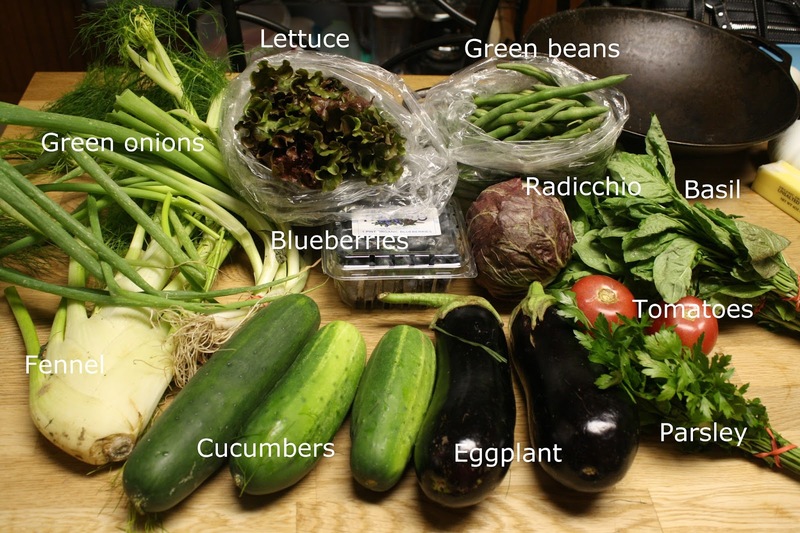 The email also told us that green beans will appear next week as well as another of my summer favorites – BLUEBERRIES. 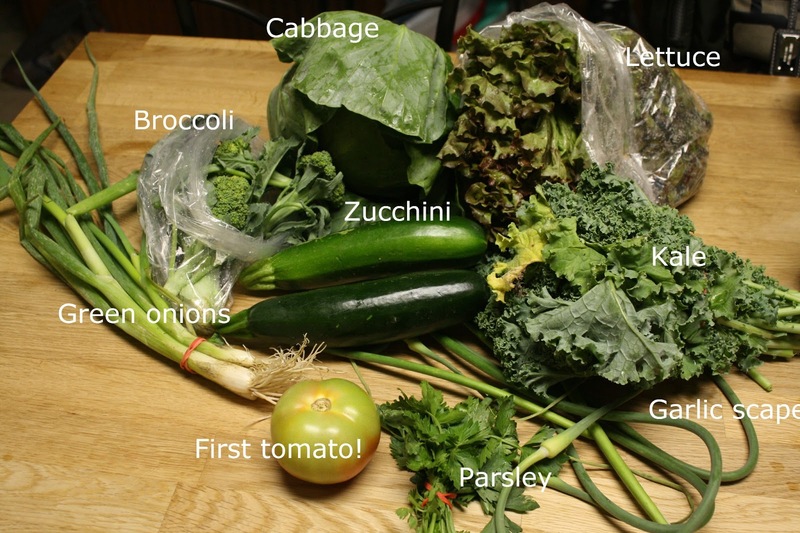 Those of you subscribing to CSAs, what did you find in your share this week? The extra day’s wait for our CSA because of the holiday was worth it this week. Ever since reading Tomatoland I haven’t been one for tomatoes out of season. Florida tomatoes are tasteless and rock hard by the time they get to Pennsylvania. So the first tomato of the season has become one of my favorite things to look forward to in the summer. I can’t wait for this one to ripen a little bit. It’s a little early for tomatoes here, so I’m not surprised this one is green. Maybe it jumped off the vine and into our CSA box because it knew how badly I wanted it? The lettuce is looking beautiful this week. Can’t wait to make salad with this. We also got more garlic scapes, so it’s probably time for some pesto. I am pretty happy to see two zucchini as well this week. Zucchini in the grocery store looks so anemic in the winter – teeny tiny little shriveled things that cost $3.99 a pound. Pretty soon farmers will be begging for people to just take them away! I might give kale chips another try. The last time I made them they were tasteless and sort of bitter, so I’m going to see if I can make them work this time. I’ve read massaging the leaves helps. Maybe it just needs some TLC.